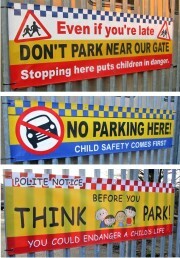 School Site Traffic Signs: Road safety and traffic calming In and around your school is of paramount importance. 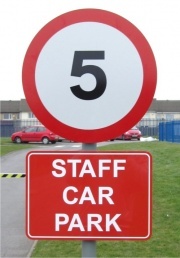 We supply a range of school site safety signs including speed limit signs, parking signs, directional signs and our new range of colourful signs intended for use near your school entrance to deter unauthorized or dangerous parking. Our range of traffic signs includes wall mounted signs, signs that can fitted on to metal railings, fences, gates, posts or supplied complete with a new aluminium post.